It can be daunting knowing what to expect before or after a spa treatment that you’ve never had before, so we take you through what to expect and how to prepare the most from your treatment, whether you’re booked in for a massage, a facial or even a body wrap. It’s a good idea to arrive at the spa reception 10-15 minutes before your treatment so that you’re not “eating in to” your allocated time and to give yourself time to wind down. Now is the moment to nip to the loo if you need to. Many people enjoy using the spa’s hydrotherapy or sauna facilities (if the spa has these) prior to turning up for their treatment. This not only helps you to relax, but also warms the muscles before a massage and gently opens the pores before a facial. To learn about further benefits see our tips page under arrive early section. When you arrive in the spa’s reception, you may be offered a glass of water, a smoothie or herbal tea. Normally you will be given a brief consultation form to fill out. This details any allergies or intolerances, medical issues, injuries or concerns that the spa therapist should know about before your treatment. You may also be asked about lifestyle habits and what kind of e.g. massage pressure you prefer. The consultation form may also ask what you would like that treatment to accomplish that day, be it to relax, to detoxify, or to target a specific area of muscular tension in your body for example. 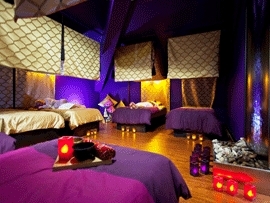 Your spa therapist will call your name and take you to your allocated treatment room. She’ll invite you to undress in the treatment room itself, or will sometimes give you an allocated locker in the spa’s changing rooms. For regular back massages you usually keep your underwear on. In the case of full body treatments or those including a body exfoliation or vichy shower, your therapist may give you paper pants to wear instead of your regular underwear. Before leaving the room to let you change, your spa therapist will normally tell you where to store your jewellery and hang up your clothes or dressing gown. Expect her to go through your consultation form with you on her return if you have flagged up any medical concerns on the form. The therapist will also let you know whether to lie face up (usually the case with a facial that does not involve a back diagnostic), or lying on your front on the massage table with your face resting in the face rest (a hole lined with tissues or a clean towel for hygiene). She will then leave the room for a couple of minutes to give you time to undress and to prepare for the treatment. When you’re ready, just climb on to the massage table and lie beneath a towel to keep warm and make yourself comfortable (a towel will normally be folded back for you to cover yourself with). After a couple of minutes or so, your spa therapist will knock quietly on the door to ensure you are ready before she/he re-enters the room. She may ask if the temperature, lighting and music are ok for you and will adjust the massage table’s height and any support cushions to ensure that you are comfortable (cushions beneath your knees help support the lower back). If you don’t like the sensation of a heated massage couch, or if you feel cold, now is the time to say! To mark the start of your treatment, your therapist may bathe your feet in a soothing bowl of warm water or cleanse your feet with a massage cloth once you’re lying on the massage bed. This is known as the “welcome touch”. And now for the loveliest part: Just relax… You can even nod off if you want to! After the treatment, your therapist may sound a small bell to gently signal the end of the treatment and will probably offer to fetch you a glass of water. She is likely to have noted spa products used during your treatment and may also offer lifestyle recommendations that will prolong the wellness benefits when you’re at home. You are under no obligation to buy anything there and then, but it is useful to retain the products card as a reminder at a later stage. You might choose to tip your therapist now if you wish to. We have this point covered in our spa etiquette guide. Your spa therapist usually waits outside the treatment room until you’ve put on your dressing gown or got dressed. She will lead you to the spa’s relaxation room, which usually features comfortable recliner beds. Some even have squishy (dry) water beds that are bliss to doze off on. Resting in this darkened room is a key part of any spa treatment. These rooms usually offer magazines to browse through, herbal teas and water to rehydrate, and fruit, nuts and seeds to nibble on if you’re feeling peckish. Many people take the opportunity to unwind here for a few minutes before facing the outside world again, so it’s worth factoring in this extra “down time” after any treatment. Again, this adds value to your spa experience. If you enjoyed your treatment, why not treat another. We offer a wide range of treatment packages which can be bought as spa vouchers or monetary gift vouchers and can be redeemed at spas across the country. For more information, please visit our spa vouchers page. Got a question about spa etiquette?